PennsylvAsia: Japanese Survivors Forum at Allderdice High School, November 8. 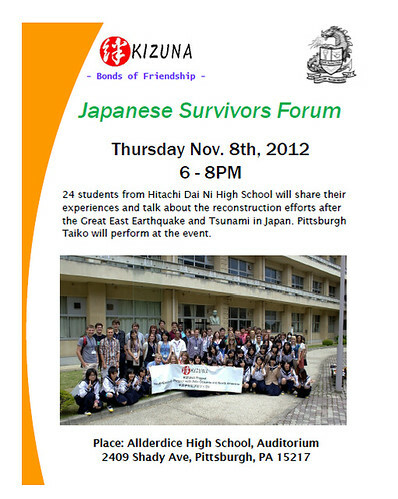 Japanese Survivors Forum at Allderdice High School, November 8. Twenty four Japanese students from Hitachi Dai Ni High School in Japan will be visiting Pittsburgh’s Allderdice High school from Nov 7- 10 as part of the high school students volunteers exchange program called the Kizuna project. Hitachi city suffered from the Great East Japan earthquake and tsunami. Allderdice students visited Hitachi Dai Ni School for two weeks, helped the city as volunteers and learned about the earthquake affected area and their people this summer. In exchange Japanese students will visit Allderdice to share the real stories of their lives with at a presentation about their experiences and recovery efforts in the area. The presentation is open to the public and begins at 6:00 p.m. on Thursday, November 8, 2012. Pittsburgh Taiko will be participating in the presentation. More about the Kizuna Project via its webpage.